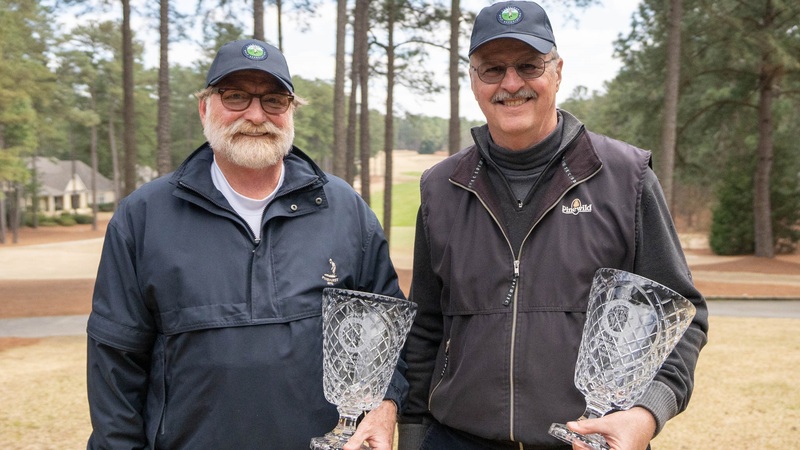 First round leaders, Don Detweiler of Raleigh and Paul Simson of Raleigh, were able to hold onto the lead to win the 3rd North Carolina Super Senior Four-Ball Championship at Pinewild Country Club’s Magnolia Course. The duo started the day with a three-shot lead over their nearest competitors. A slow start by the leaders on a much colder and windier final round, allowed the team of Lawrence Hicks of Greensboro and Alan Dirk of Pittsboro to pull within two at the turn. A birdie by Dirk on No. 11 gave his team a tie for the lead after a bogey by Simson and Detweiler on the same hole. Simson and Detweiler were able to rally back making birdies on Nos. 12, 13 and 18 to ultimately win the championship with a two round total of 7-under 137. Hicks and Dirk as well as the team of David Millis of High Point and Kim Mansfield of High Point finished tied for second place after shooting 4-under 140’s for the championship. The win marks the seventh four-ball CGA Championship won by Simson and Detweiler as a team (2008 and 2010, 2012 Carolinas Senior Four-Ball, 2009 and 2013 NC Senior Four-Ball and 2018 Carolinas Super Senior Four-Ball). Chuck Wunsch of Pinehurst and Bernie Schultz of Pinehurst used their local course knowledge to rally back from a two-shot deficit after round one to fire a 3-under 69 in the final round to win the 70+ Division by two shots. Jan Gustafson of Wilmington and Jon Abbett of Wilmington, Terry Rathman of Gastonia and Russ McLauchlan of Fuquay Varina, and Vardaman Banks of Mathews and Jerry Hartsell of Midland all finished tied for second place in the 70+ Division with a 4-under 140 total for the two rounds. The CGA wishes to thank the members and staff of the Pinewild Country Club, especially the Head Golf Professional, Kyle Kirk, Club Manager, Christopher Little and Director of Golf Course Maintenance, John Robertson. Pinewild Country Club (Magnolia Course), Pinehurst, N.C. The North Carolina Super Senior Four-Ball Championship is conducted at 36 holes of four-ball stroke play. Entry is open to any male amateur golfer age 65 and older who is a legal resident of North Carolina, is a member in good standing of a club which is a member of the Carolinas Golf Association and has an active GHIN® USGA Handicap Index®. Teams may sign up for the Championship Division or 70+ age Division. The CGA annually conducts 48 championships and five team match competitions for men, women, juniors, and seniors. It also runs over 140 One-Day (net and gross) events and qualifying for USGA national championships. The CGA serves golf in the Carolinas with numerous programs such as: the USGA Handicap System; tournament management software and support; course measuring and course/slope ratings; agronomy consultation; answers about the Rules of Golf, Rules of Amateur Status, and Handicapping; Carolinas Golf Magazine; Interclub series; Tarheel Youth Golf Association; Carolinas Golf Hall of Fame; expense assistance for USGA Junior and Girls' Junior qualifiers from the Carolinas; and the Carolinas Golf Foundation (CGF). The CGF has distributed more than $1,500,000 since 1977 to benefit Carolinas' golf initiatives including junior and women's programs. For more information about the CGA, visit www.carolinasgolf.org.